Background: Acute symptomatic seizures and epileptic disorders are frequent health problems of elderly patients. An early and reliable distinction of the seizure etiology is important to ensure adequate treatment, and to prevent unwarranted diagnostic and therapeutic procedures. 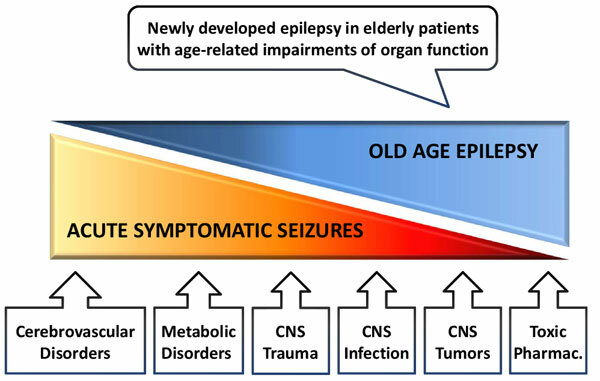 Methods: We review the current literature based on a MEDLINE search, describe age-related problems in detail, with particular attention to clinical practice, discuss possible criteria and potential pitfalls for diagnostics, and provide a compilation of etiologic factors for acute symptomatic seizures. Results: The most common causes of acute symptomatic seizures - acute cerebrovascular disorders, metabolic disorders, traumatic brain injury, meningo-encephalitis, cerebral tumors, and withdrawal of alcohol and other central agents - are well-defined and seem to permit straightforward diagnostic and therapeutic strategies. The current classification of seizures and epileptic syndromes apparently provides clear definitions. However, multiple age-related risk factors, as well as a reduced discriminatory power of clinical and technical diagnostic criteria can make the distinction difficult. Conclusion: Typical age-related problems are incomplete or missing medical history, dementia, oligosymptomatic seizures, inconclusive EEG and cerebral imaging results, multiple pathological findings and comorbidity with ambiguous significance, confounding sleep disorders, intake of proconvulsive drugs, and psychogenic seizures. All diagnostic and therapeutic decisions need to be based on an integrative and individual approach that includes diagnostic findings and risk factors, the intake of medications and other agents, and the social situation of the elderly patient. Keywords: New onset epilepsy, old age epilepsy, acute symptomatic seizures, provoked seizures, neurogeriatrics, epileptogenic drugs, dementia. Keywords:New onset epilepsy, old age epilepsy, acute symptomatic seizures, provoked seizures, neurogeriatrics, epileptogenic drugs, dementia. Abstract:Background: Acute symptomatic seizures and epileptic disorders are frequent health problems of elderly patients. An early and reliable distinction of the seizure etiology is important to ensure adequate treatment, and to prevent unwarranted diagnostic and therapeutic procedures.